Half the fun of having a cat is touching and holding and cuddling with him. Being held and examined are also crucial for veterinary visits. For your cat to be at his best in a variety of situations, you need to give him positive experiences with those situations while he’s still a kitten. 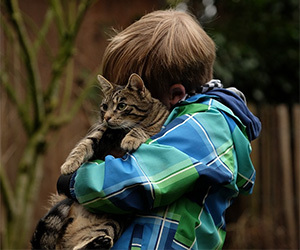 You want your cat to be able to be handled by you or by strangers without having him try to wriggle away or scratch. Smart and regular cat handling will make him more pleasant around the house, more popular with company and a better patient when visiting the veterinarian. Start young. Hold your kitten in your lap when he’s drowsy and let him fall asleep as you stroke him. Use long, gentle strokes rather than short, choppy ones. Start by stroking down the length of his back and sides. Use one finger to rub behind his ears and under his chin. Gently stroke his chest and abdomen, taking care you don’t entice him to start playing. Once your kitten is fine with petting and carrying, have a friend do the same thing, beginning with the touching exercises. For kittens who have grown up in your household and met strangers already, that step is not usually difficult. It’s quite possible the kitten will jump into your friend’s lap and make himself at home. But for feral kittens you’ve tamed, or for household kittens who have not met many strangers, you may need to start slowly. For suspicious or recently feral kittens, have your friend sit with you in a small room that doesn’t have furniture the cat can hide under. At first, your friend should ignore the kitten. Watch television or just chat as the kitten becomes accustomed to the new person. It’s best if the kitten is a little hungry so the friend can offer him an irresistible treat. Still sitting (on the floor is ideal), the friend can introduce a toy that allows the kitten to pounce and play. Gradually use the toy to entice the kitten over the friend’s legs and lap and to keep him there longer and longer. Again, the friend can offer the kitten a treat. It’s best at this point for the friend not to talk to, reach for or make direct eye contact with the kitten. With luck, the kitten will get tired and fall asleep in the friend’s lap, but otherwise wait for him to get drowsy or fall all the way asleep and then gently transfer him there. Have the friend stroke him with long, gentle strokes. On subsequent days advance to touching other parts of his body. If the cat won’t even come close to the stranger, use a trail of tasty morsels leading to the person to entice him closer and closer, with the person ignoring him all the time. If that’s still too intimidating, work on having the cat eat in a cage in the same or next room, where he can see the stranger, gradually working up to closer proximity. Most cats don’t mind being petted or stroked, but they may protest at the next steps. Hold each of the cat’s paws and gently press on each toe so the nail is unsheathed. That action will be necessary when you clip his nails. If possible, offer him a tiny but delicious treat after each toe or foot. Again, it’s best to do this when he’s drowsy or relaxed. You don’t want to reach for a foot when he’s standing up, because you’re almost guaranteeing a tug contest with his foot if you do. And you don’t want to ever lose any contest with your cat when it comes to handling, because if you do, he will learn that he can wriggle, scratch, hiss and growl his way to freedom — exactly the lesson you never want him to learn! If a contest does ensue, make sure you win, but then quickly switch to an easier exercise you can reward him for. Then go back to the contested exercise and try an abbreviated form — your goal is for him to let you do it rather than for you to force him to do it. Always reward him for good behavior. Look into your kitten’s ears, gently folding back the outer ear so you can let light in. Rub your finger or a cotton ball around inside. But don’t stick anything into the ear canal. Next lift his lips and look at his teeth. Run your finger or a piece of gauze over his teeth. Such training will be important later for brushing his teeth. Use lots of treats and rewards. Finally, open his mouth by gently pushing your finger between the teeth on one side. Just open it for a second; even the best-behaved cat is not going to sit there and say “Ahhh.” Follow with a special treat. Ideally, you should also accustom your cat to taking pills by giving tiny treats instead. Open your cat’s mouth, place a teensy, tasty bit toward the back of the mouth, and let him swallow it. You can even follow it with a second treat offered the normal way. When giving an actual pill, either give it wrapped in a tasty treat or place it as far back in the mouth as possible, then close his mouth and gently stroke his throat to get him to swallow, or offer him a drink of water. The ability to take medications will make treating any illness your cat might develop much easier. In fact, all of the handling exercises will make it easier for your veterinarian to examine your cat, arrive at a well-informed diagnosis and treat him effectively. Grooming is another area in which early handling will make a big difference. Just as you shouldn’t wait until your cat is ill for him to experience being examined by a stranger, don’t wait until he’s matted for him to experience being groomed. Start early for ultimate success.